Like many American small towns, Medora, Indiana was hard hit by the recent economic downturn, which was in itself but a cruel exclamation point to decades of dwindling manufacturing jobs. Once the town boasted two big employers, a brick plant and an auto parts factory, that provided well-paying positions for a booming middle class, but with them out of business, Medora's population has dropped sharply, as have incomes and property values. Mirroring the town's seemingly unwinnable battle against changing economic forces is the plight of the local high school basketball team, the Medora Hornets, formerly one of the most competitive in the area, now a ragtag squad of underprivileged kids locked in a seemingly unbreakable losing streak. 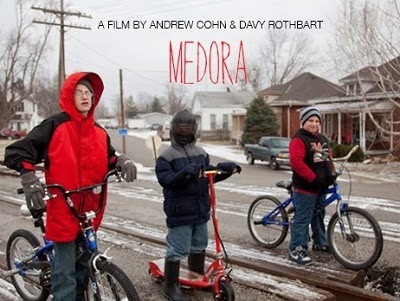 Following the lives of these teenage athletes as they struggle to turn things around is the engrossing new documentary Medora, directed by Davy Rothbart, longtime publisher of Found Magazine, and Andrew Cohn. As hard as the team practices however, the deck is stacked against them, not only because their opponents come from incorporated high schools with more students and bigger budgets, but because the problems of a community caught in the grip of poverty, from alcoholic and absentee parents to run-ins with the law, provide a constant distraction, and compound the apparent hopelessness of their demoralizing cycle of defeat. Nobody in town is hoping for a Hoosiers-style championship run, just one much-needed win, no matter how symbolic. In a variety of ways, Rothbart and Cohn's film, which was produced in part by Steve Buscemi and Stanley Tucci, recalls 1994's Hoop Dreams, only inverted (and not as good, though it's probably unfair to compare it to a bona fide documentary masterpiece). While Medora takes place in a rural, predominantly white setting, not the slums of inner-city Chicago, and profiles perpetual losers instead of talented players with an embattled shot at pro-ball stardom, the issues that motivate them are very much the same. Both are about America failing its marginalized youth, consigning them to crumbling housing, substance abuse and a failing educational system, and how lessons learned on the court can help undo some of that damage. Filmed over the course of two years, Medora is revealing but compassionate when it comes to its adolescent subjects, none of whom have had any easy go of it, grappling with learning disabilities, homelessness and other adversity, and is effective at drawing you into rooting for these epic underdogs, but feels somewhat short on drama considering the competition and precarious situations involved. Yet, while it's not as gripping as it maybe could be, there's a wistful, earnest sense of melancholy pervading every lingering shot of dilapidated buildings, every desperate locker room pep talk and even the nail-biting finale, that proves subtly, quietly affective, largely because, in the end, a Hornet's victory isn't the game-changer Medora really needs.